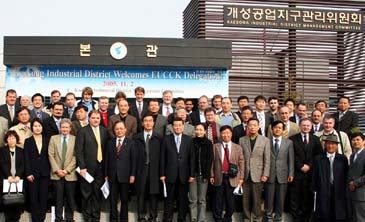 A second EU-DPRK workshop on economic reform was held in Pyongyang from Oct. 11-14, 2005. The purpose of the workshop was to allow European economists who have worked in transition economies to exchange experiences and with North Korean officials who are now responsible for economic modernization in the DPRK. The first workshop, held in August 2004, had involved a general overview of economic transition processes and the changes in the DPRK since 2002. This second meeting had a more specific focus on some of the practical issues that were raised last year. These included the role of the state in economic management, strategies to attract foreign direct investment and the restructuring of state-owned enterprises and agriculture. The first session examined the role of government institutions in a transition economy. It looked at the choices governments make between a centrally planned economy and a completely laissez-faire system and how the work of government institutions changes as an economy moves from central planning to one with market incentives. It concluded with a presentation on the use of macro-economic tools such as budget allocation, credits and interest rates. The second session looked at ways to attract investment, in particularly the need for transition economies to gain foreign investment. Discussion centred on some of the strategies East/Central European countries such as Hungary, Poland and the Czech Republic had used to accomplish this. European experts described how they had gone about designing a legal framework for economic activity. They also exchanged views on contemporary methods of management including ways of strengthening human resources through enhanced training and education. The session ended with a discussion of some of the reasons for success and failures of small and medium enterprises in European transition economies. The DPRK up-dated the European participants on measures taken by the DPRK government to modernize its economy. This included a description of measures taken to modernize state-owned enterprises and delegating new responsibilities to managers over the last three years. The participants then joined separate working groups to discuss in one group, more detail practical measures to modernize state-owned enterprises and in the other group incentives for managers and workers. The DPRK hosts were led by Vice Minister Kung Sok Ung. Almost 100 DPRK officials from economy related ministries and institutions took part in the workshop. The European delegation consisted of economic experts from eight EU Member States. They were joined by EU diplomats and representatives of the foreign business and aid community resident in Pyongyang. Following the workshop the European delegates visited the "March 16" Wire Factory in Pyongyang to view first hand a new DPRK enterprise. Participants then visited the Gaesong Joint Industrial Zone. The workshop was organized by the Seoul Delegation of the European Commission and the Friedrich Naumann Foundation in conjunction with the DPRK Ministry of Foreign Affairs. They were assisted by the UK Embassy in Pyongyang, representing the presidency of the EU. EU Member States sponsored participation of their economic experts and diplomats.